The original recipe was designed for baking in a microwave. The directions here are for baking in a normal oven. Cook oatmeal and water uncovered until mixture boils. About 3-4 minutes in microwave. Stir once and set aside. Blend all ingredients well. Stir in oatmeal mixture. Grease bottom of glass12x8 pan. Pour into pan. Bake at 325 for 40-50 minutes - until toothpick comes out clean. Combine all ingredients and heat. When well blended spread over cake. Topping may be put under the broiler for a few minutes till golden brown. 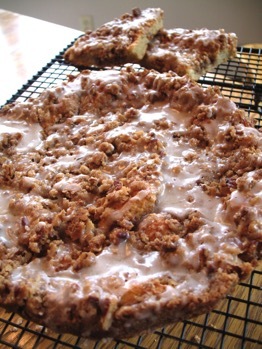 Peg ran across a recipe in Bon Appetit magazine showing all the variations of a yeast-dough. This set off a firestorm of ideas. 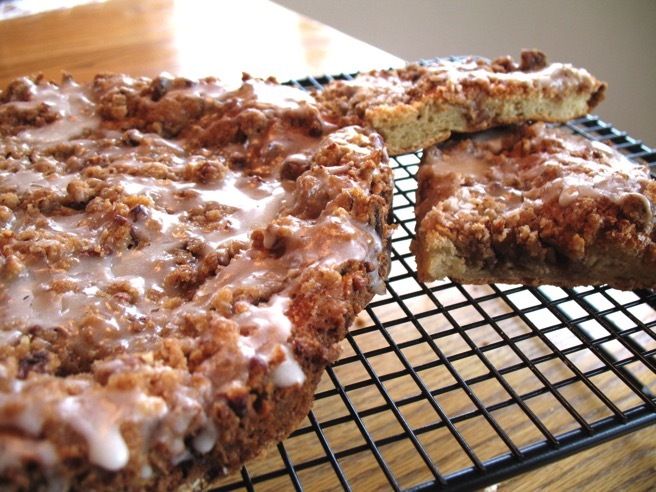 She woke up early Saturday in anticipation of making this coffee cake. Of course it was a wheat-based recipe, so it'd have to be converted. Mix together all dry ingredients except sweet rice flour (brown rice flour, tapioca starch, sugar, xanthan gum, yeast and salt). In a heavy mixer, combine wet ingredients (water, vinegar, oil, and eggs). Slowly add dry ingredients to well blended wet ingredients. Beat on medium/medium high speed for 4 minutes. Dust two 8" round cake pans with flour (or oil bottom of pan and lightly dust oiled pan). Place dough in a warm spot, allow to rest/rise for 35-40 minutes. Mix streusel ingredients in a bowl until crumbly. Bake for 12-18 minutes or until the top is slightly browned. Mix Glaze ingredients in a bowl. Add milk slowly as needed - mixing until the desired consistency. Allow to cool before drizzling the glaze. You could sub-out the flours with your favorite flour blend if you like.